Notes from the Plumb Tree: I have found a cause! I have found a cause that I can get behind and donate 10% of my sales from my boutique to. "This, then, is the Blood:Water Mission, committed to clean blood and clean water to fight the HIV/AIDS pandemic, to build clean wells in Africa, to support medical facilities caring for the sick, to make a lasting impact in the fight against poverty, injustice and oppression in Africa through the linking of needs, talents and continents, of people and resources. " It's a fabulous organization supported by many other organizations working together. 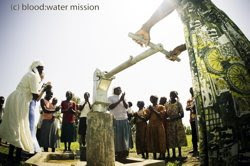 Started by Dan Hasseltine the lead singer of Jars of Clay who visited Africa in 2002, he came back with a vision for clean blood and clean water in Africa -- blood free of the HIV virus and water free of parasites and bacteria that cause AIDS patients and others undue suffering. He and his band mates envisioned this orphaned continent to be transformed through the installation of Christ's sacrificial symbols of blood and water. 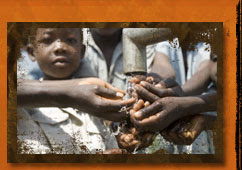 Did you know $1 can give one African clean water for a year? I didn't. So while my shop is small, small gifts make a big difference! I am exited to get on board in my small way and not just throw up my hands calling the job too big. "The crisis in Africa is difficult to translate to those of us living in the states. Our hearts do not know where to begin. Of the greatest accomplishments of Bloodwater Mission has been their ability to sort through the chaos to match provision with need. Clean water prevents many diseases that can prove fatal to a person suffering from AIDS. Clean water, then, guards clean blood. 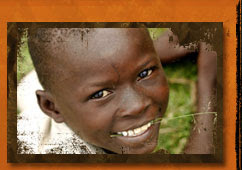 The simple gift of a dollar provides invaluable clean water for one African for One year. Our calling, then, is to give from our undeserved provision into their undeserved need. In doing so, we participate in the search and rescue mission God is orchestrating in this fallen world." Way to go, Jenny! An excellent cause - I'm proud of you!